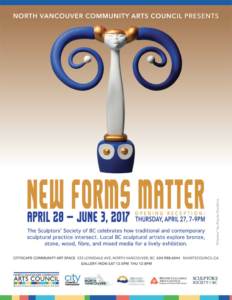 My automata will be featured in the upcoming Sculptors’ Society of BC show “New Forms Matter” from April 28 – June 3, 2017. In this show, traditional themes derived from nature and portraiture cross-pollinate with our modern understanding of molecular structure and engineering. Please join me on Thursday, April 27 for the opening reception at CityScape Community Art Space, 335 Lonsdale Avenue, North Vancouver from 7pm – 9pm.